I’m really glad you all like the sausages! I have a couple sitting in my fridge waiting to go in another seitanic potpie I’m making for my mom’s birthday (which is today, but we’re celebrating tomorrow). Now, step two of the perfect winter meal. Bread! My friend Melissa (who regularly stalks the blog–hey Ranger!) made this bread the other week and I fell in love with it. As a no-knead bread, it couldn’t be any simpler, and it’s…well…perfect. I’m getting a sourdough vibe from it. But you don’t have to have any starter. Just flour, yeast, salt, and water. I’m not sure where she pulled the recipe from, so I can’t credit it, but damn, it’s good. You can also use half whole-wheat flour, half all-purpose/bread flour, but apparently it’s a no-no to call it Bosnian Bread when it’s whole wheat. But it’s ridiculously tasty that way too! Spray a loaf pan with vegetable spray oil. Scrape dough into pan and let it rise for 30 minutes. After it has risen, place in a cold oven. Turn the temperature to 500 degrees and bake for 15 minutes. After 15 minutes, turn the oven down to 300 degrees and bake for another 45 minutes or until lightly browned on top. Let it cool on a baking rack before you slice into it. It’s worth it for a nicely sliced piece! Ahhh, bread. Eating storebought right now, but we’ll get back to it – in another country first, and then after the place has had a chance to recover from the ick. Happy birthday Cupcake Punk’s mum! That bread looks super yum – light and delicious. that bread looks great! and easy. 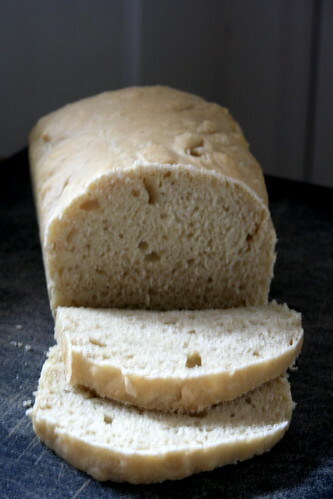 easy bread that looks and tastes great is a quest of mine. i can’t wait to try this! does this bread hold up well for sandwiches? i have tried simple breads like this for sandwiches but the bread just disintegrates into a million crumbs =/ i would like to have an easy bread like this for sandwiches. Happy birthday to your mom!! Bread really MUST be part of a perfect winter meal! the long sit really helps flavor develop. looks tasty! In Boston, check out Grasshopper. It is in Alston on the orange line of the T-train, if memory serves. They have a fungus soup that is off the chain! Hope this helps. the bread looks great, really fluffy!! Wow, that soup looks incredibly delicious! Maybe. Although it’s hard to credit when one writes down a recipe from memory and hands it to you on a note card. Maybe her friend who gave her the recipe got it form the internet, maybe not. This could be a well known recipe. But thanks for the link! Just made this bread and it’s wonderful! Great recipe!